The trade winds, the Gulf Stream and Gran Canaria’s geography have blessed this island with a wonderfully mild climate year-round, making it a great holiday destination and just a step away from mainland Europe. In terms of annual weather, you can see in our weather charts that the average maximum temperatures remain very consistent throughout the seasons, ranging from 25 ºC and 28 ºC in summer (June, July and August) and between 21 and 22 ºC in the winter months (December, January and February). March marks the beginning of spring and is a unique occasion to visit the capital, Las Palmas, where the International Film Festival is held. Although temperatures in Gran Canaria are pleasant throughout the year, they begin to increase in April and May. The weather in the autumn months of September, October and November is quite similar to spring, although warmer and with a bit more rain. And that’s not all. At any given time of the year you will be able to enjoy several and very different microclimates depending on where you are — the coast, the interior or the mountains. Sometimes, you can see snow in the highest peaks and you just need to travel down to the coast to spend the rest of your day basking under the sun — from subtropical to continental climates in one day! The Canary Islands are a popular destination. 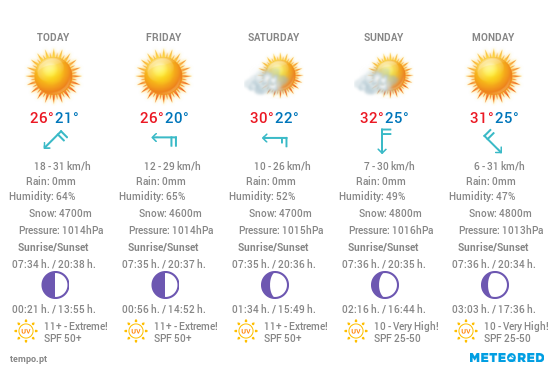 Check out our weather forecast for the next 6 days in Las Palmas!